Bring a touch of sunshine to your home with the fabulously versatile Candy Chair Yellow. Pair this sunny piece with other vibrant designs for a funky aesthetic, or introduce to more neutral interiors for a fantastic contrast. The Candy truly is a must have! Forged of solid wood and finished in a bright yellow colour, its curved backrest is comfortably tall and supportive, whilst the colour is sure to brighten your home. Four strong legs support the seat, which include rubber floor protectors to help to avoid damage to your floors. This chair is also designed to be stackable. "Love the chair, the colour, good quality"
Arrived on time as stated only ordered Sunday evening and arrived 2 days later. 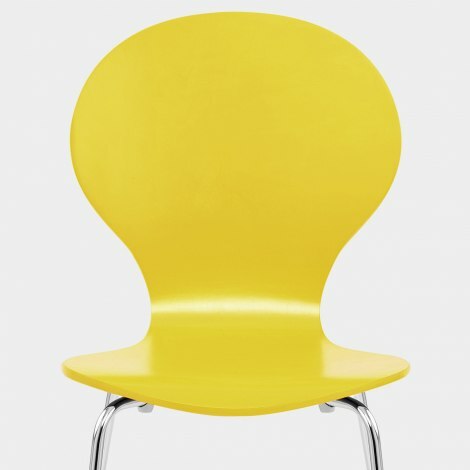 Well made chairs, the yellow is vibrant and goes lovely with my kitchen, would highly recommend this web site. Fab product, great quality, great price and speedy delivery. We bought two yellow a green a red and a blue. They took no time at all to assemble and look great. Bought 10 of the chair and mixed them up for a bit of variety and think they look smashing. Easy to put together and an easy company to deal with. Product was reasonably price also. The chairs arrived in good time and the product itself was easy to assemble and of good build. Must say that the service team are fantastic to deal with. I had a query on a later purchase and they were very efficient when answering. Also bought some bar stools.